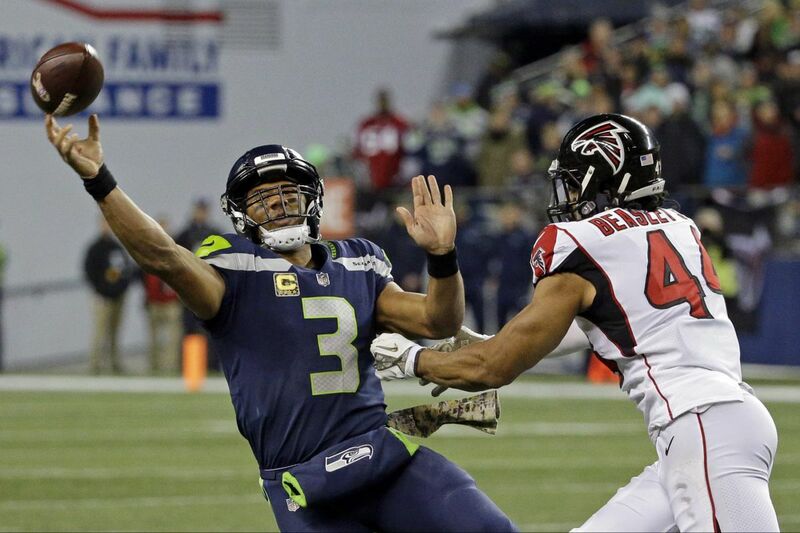 How much of a factor will Seahawks quarterback Russell Wilson (3) be Sunday night? Our beat writers' predictions for the Eagles-Seahawks matchup, scheduled for 8:30 Sunday night in Seattle. The Eagles' MO this season has been to jump out to a big lead and force teams to abandon their offensive gameplan. They have outscored teams in the first quarter, 78-18, and in the first three quarters, 256-108. It would behoove them to get a big lead Sunday night because they're going against the best fourth-quarter team in football. The Seahawks have outscored opponents in the fourth quarter, 104-46. Russell Wilson leads the league in fourth-quarter passing. Fourteen of his 23 touchdown passes have come in the fourth quarter. If it's close or the Eagles are behind going into the final 15 minutes, be afraid, Eagles fans. Be very afraid. But with half of the Seahawks' Legion of Boom missing, I don't think it will be. The Seahawks seem really miffed about being 5.5-point underdogs at CenturyLink Field. But being miffed doesn't bring back Richard Sherman, Kam Chancellor or Cliff Avril. Seems like every week I caution that the coming game might not be as easy as some folks think. This time, I really mean it. Tough challenge for the Eagles' run game, and for the guys protecting Carson Wentz. But really, there is one Seahawk capable of winning this for Seattle: Russell Wilson. I don't think Jim Schwartz, Malcolm Jenkins, Brandon Graham, Fletcher Cox and the guys are going to let that happen. The Seahawks will be without half of their Legion of Boom defensive backfield. They've lost two straight at CenturyLink Field, where they have been near invincible over the last eight seasons. And their run game has been relegated to Russell Wilson and whomever else they can super glue into the lineup. These aren't the Seahawks who went to back-to-back Super Bowls in 2013-14. And still, they're dangerous, and probably the best team the Eagles will face since Week 6 in Carolina. On defense, Richard Sherman and Kam Chancellor are out, but super safety Earl Thomas remains. Bobby Wagner and K.J. Wright cover as much ground as any linebacker duo. And the front is above average. The Eagles have one of the NFL's most potent offenses, but scoring points in Seattle could be difficult. The Seahawks offense should have as much trouble finding the end zone, though. Wilson is always dangerous — both through the air and on the ground. Tight end Jimmy Graham is a red zone beast with the most targets (24), catches (14) and touchdowns (8) in the NFL. And receiver Doug Baldwin will give Patrick Robinson all he can handle in the slot. But the offensive line is among the worst in the league. The Seahawks should have trouble rushing the ball, and Wilson might not have even time to throw, even with his scrambling ability. This is a difficult one to predict. It's hard to pick against the Eagles right now, considering they're on a nine-game winning streak and might just be the best team in football. And the Seahawks are not the same as they were when they were atop the league in recent years. But a hungry Seahawks team at home in December with Russell Wilson at quarterback is still dangerous — they've won 10 of their past 13 home games in December. That's why I'm picking the Seahawks. This is not a pick against the Eagles as much as it is for Wilson and Seattle. I also don't think the Eagles run the table the rest of the way, and this is where I can see the loss coming. Wilson and Seattle's receivers will challenge the Eagles secondary. A big game from Wilson is the best chance of an upset. Making the Seahawks one-dimensional by taking out their running game won't be as effective Sunday. On offense, the Eagles will rely on Wentz and the passing game against a depleted defensive backfield. Although the Eagles have had success running the ball this season, Seattle is more vulnerable through the air at this point. This is going to be a close game, and it's impressive that the Eagles are road favorites. But the Eagles haven't played in many close games this season and Wilson is best in the fourth quarter. I'm going with the desperate team in December. If I'm wrong, I'll be ready to hear from you about it.